School calendar printing specialists, each year we help schools to raise money with one of our personalised school calendars. You can potentially raise more than £900.00 with just one simple promotion. Check out our school calendar printing website for great value school fundraising calendars ” Click Here To Visit Calendars For Schools”. All of our calendars are printed in colour, this creates a vibrant and colourful school calendar. Colour calendars allow you to make maximum profits. We know that the extra cash would help you to provide the children who attend your school with books, computers, play equipment etc. Jus to give you an indication of the profit you can potentially make we produce 250 A4 full colour personalised fundraising school calendars for just £792.50 (Price includes VAT and x1 UK mainland delivery); at just £3.17 each calendar, thats a great price. What you sell your calendars for is upto you, however advertise and sell your fundraising calendars for £6.00 each you will make £707.50 for your school, if you increase your school fundraising calendars selling price to £7.00 each you will make a huge profit of £957.50. 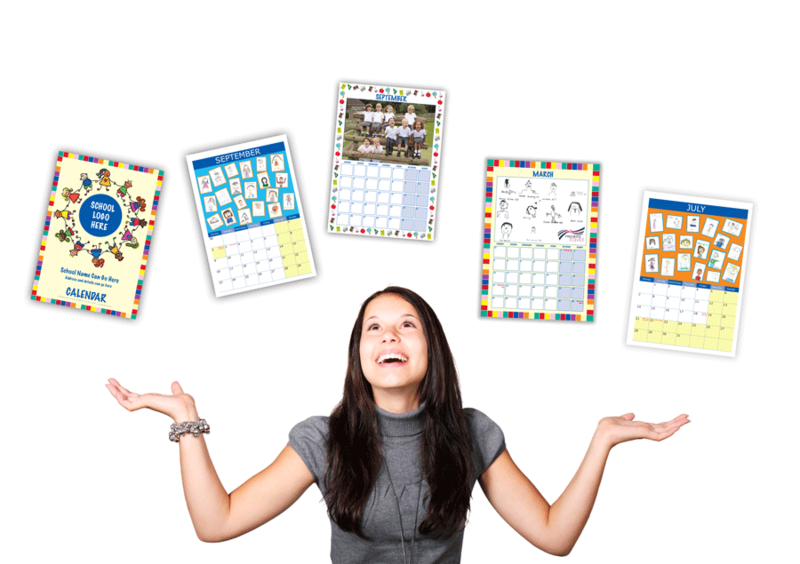 We have a range of calendar designs that you can choose from to create your own custom school calendar. You can view our designs at www.calendarsforschools.co.uk. You can choose from portrait style calendars, landscape school calendars and they are available in sizes A4 and A3 calendar sizes. Creating your School Fundraising Calendar is easy; view our designs and choose the design you wish to use, all you just need to supply is your twelve or thirteen images (The amount of images will depend if you wish to use an image on the front cover) along with your school logo for the front cover, you can also add school dates to your school calendar for example you can add your school fete, sports day, parents evening, half term dates and we will create and print a calendar that parents will find invaluable throughout the year and when they see the date come up on your school calendar it will remind them to attend your special school event. Easy School Fundraising Calendar at its best. You can use class photographs, paintings, drawings, images taken at events like sports day, school fete, and plays to personalise your calendar. When sending your digital files it helps us if you name them 01jan, 02feb, 03mar, 04apr and so on. You can supply flat artwork/photographs for us to scan, again please mark clearly each month. It helps us if the images supplied are landscape; it is easier to place your images into our template and prevents us from cropping your image. All of our school calendar designs can be adapted to include advertising / sponsorship space, the advertising space can be used to make further profits for your school. Calendars are a very flexible fundraising product and can enable you to make big profits by selling advertising space on your calendar to local businesses. You can start by asking parents at your school, if they have a business, they may want to sponsor your school calendar, promote their business and support your school at the same time by paying for advertising space on your calendar. If you sell your adverts for say £25.00 each, multiply that by twelve and you can see you can start to make serious money for your school; and that’s before the profits you will make by selling your calendars! 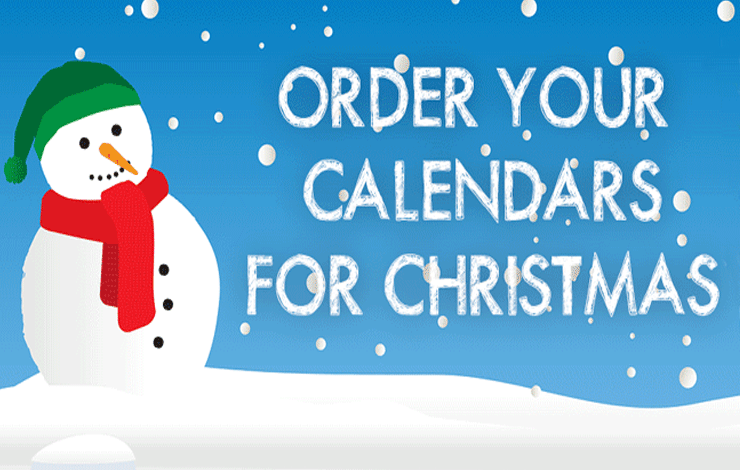 We currently have a choice of calendar, our standard A4 and A3 calendars come with thirteen sheets. Your A4 and A3 calendars depending on the design you select can be either portrait or landscape. Each sheet is printed full colour on 150gsm recycled paper. This style of fundraising school calendar also comes with grey backing board and they are supplied wire bound at the head with white wire. All you have to do is hang on the wall. The other calendar style we provide is an A3 calendar, this calendar is two sheets of A4 wire bound in the middle; when closed your calendar is A4 size, when opened the calendar becomes A3 size, these calendars are printed on a 200gsm stock and come with a hole drilled in the calendar for hanging on the wall. Phone 01284 767575 for further information about School Calendar Printing.